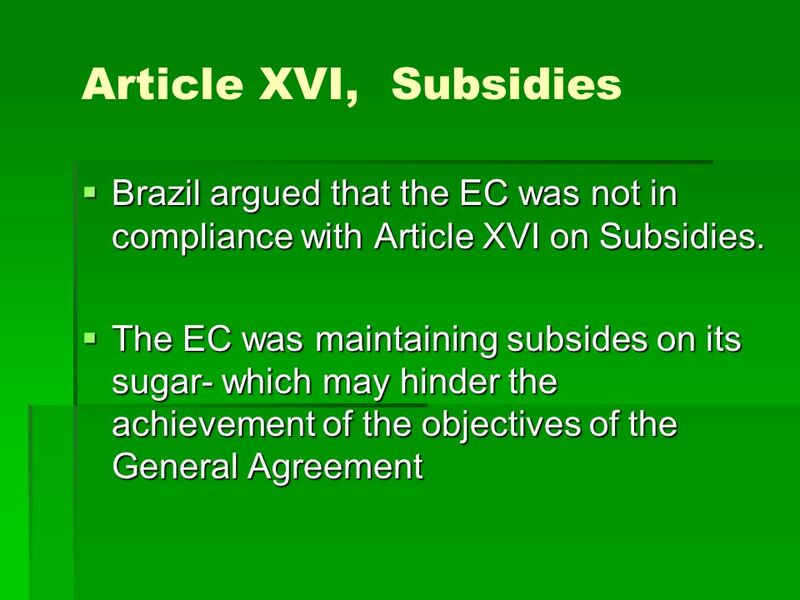 EC Brazil Export Subsidies on Sugar. European Community and Brazil October 16, 2006 Group 6- Sarah, Linda and Seniha. 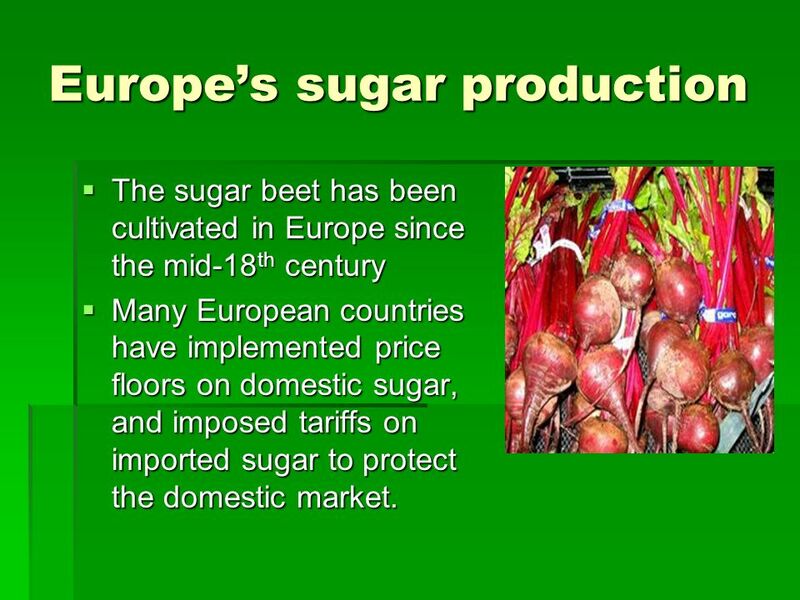 4 Europes sugar production The sugar beet has been cultivated in Europe since the mid-18 th century The sugar beet has been cultivated in Europe since the mid-18 th century Many European countries have implemented price floors on domestic sugar, and imposed tariffs on imported sugar to protect the domestic market. Many European countries have implemented price floors on domestic sugar, and imposed tariffs on imported sugar to protect the domestic market. 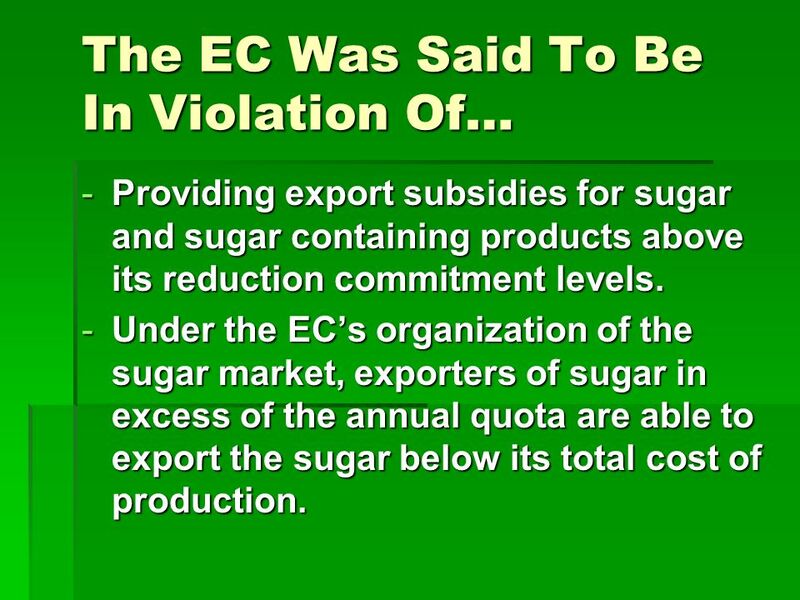 7 The EC Was Said To Be In Violation Of… -Providing export subsidies for sugar and sugar containing products above its reduction commitment levels. -Under the ECs organization of the sugar market, exporters of sugar in excess of the annual quota are able to export the sugar below its total cost of production. 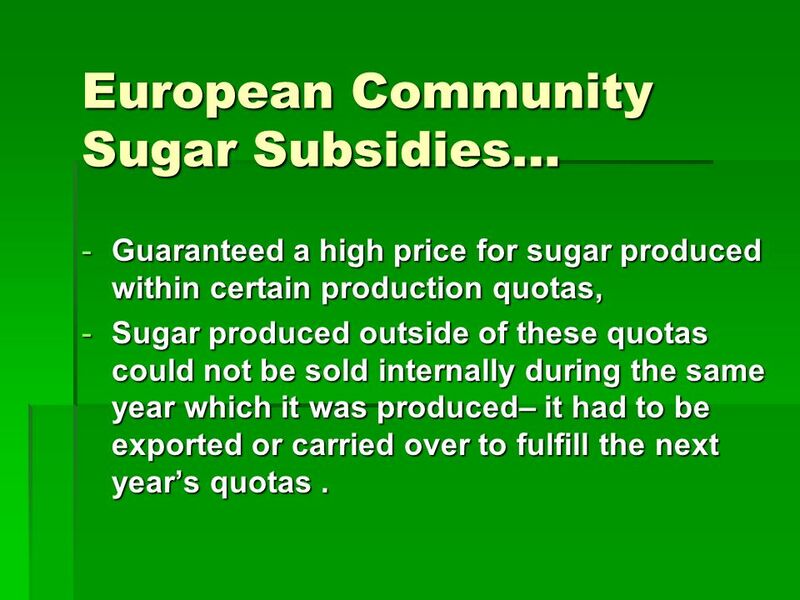 8 European Community Sugar Subsidies… -Guaranteed a high price for sugar produced within certain production quotas, -Sugar produced outside of these quotas could not be sold internally during the same year which it was produced– it had to be exported or carried over to fulfill the next years quotas. 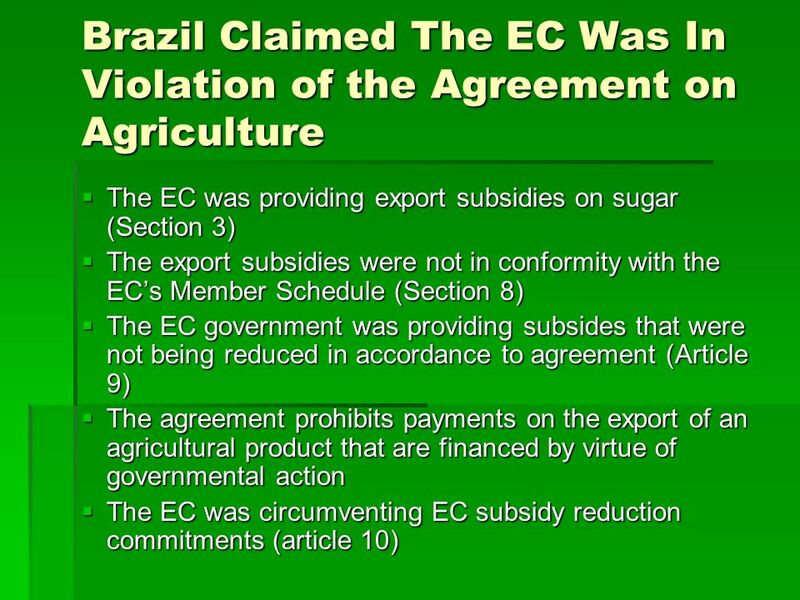 9 Brazil Contested Its Sugar Market Was Hurt Because… The EC accorded less favorable treatment to imported sugar and was in violation of Article III:4 of the GATT 1994. 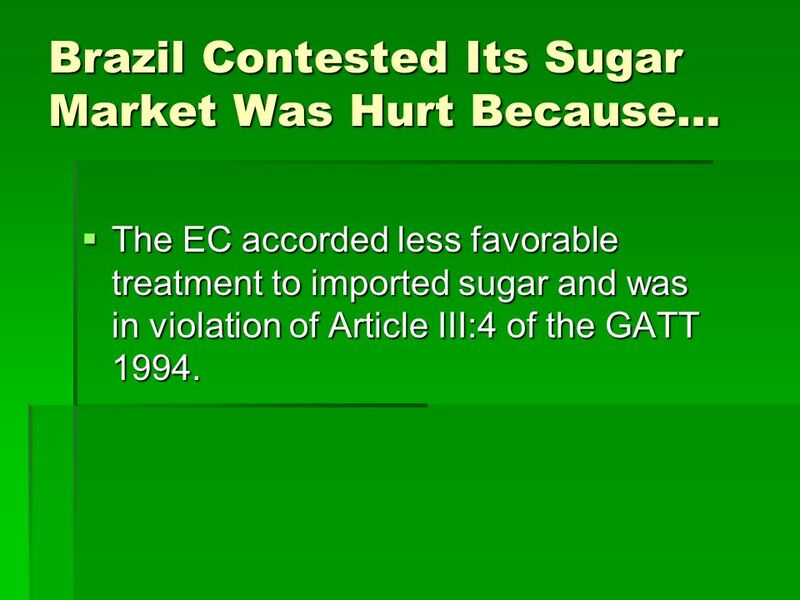 The EC accorded less favorable treatment to imported sugar and was in violation of Article III:4 of the GATT 1994. 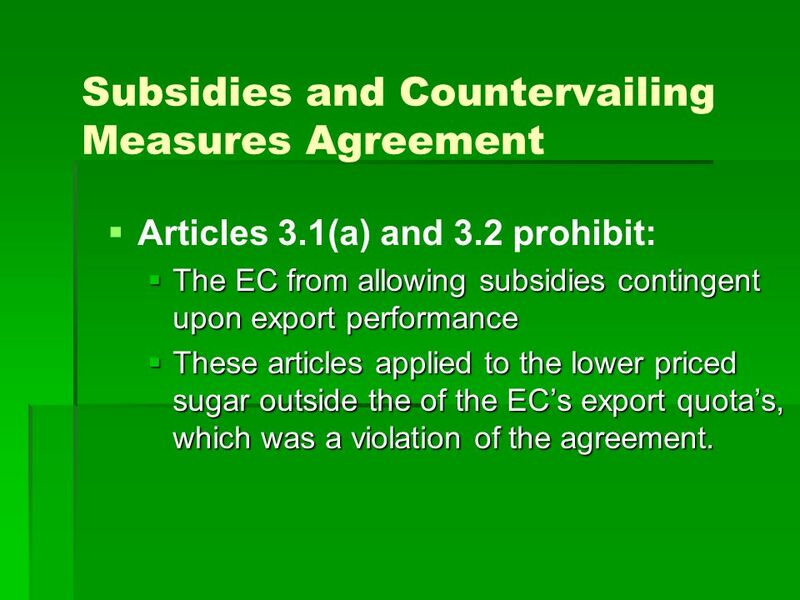 11 Subsidies and Countervailing Measures Agreement Articles 3.1(a) and 3.2 prohibit: The EC from allowing subsidies contingent upon export performance The EC from allowing subsidies contingent upon export performance These articles applied to the lower priced sugar outside the of the ECs export quotas, which was a violation of the agreement. 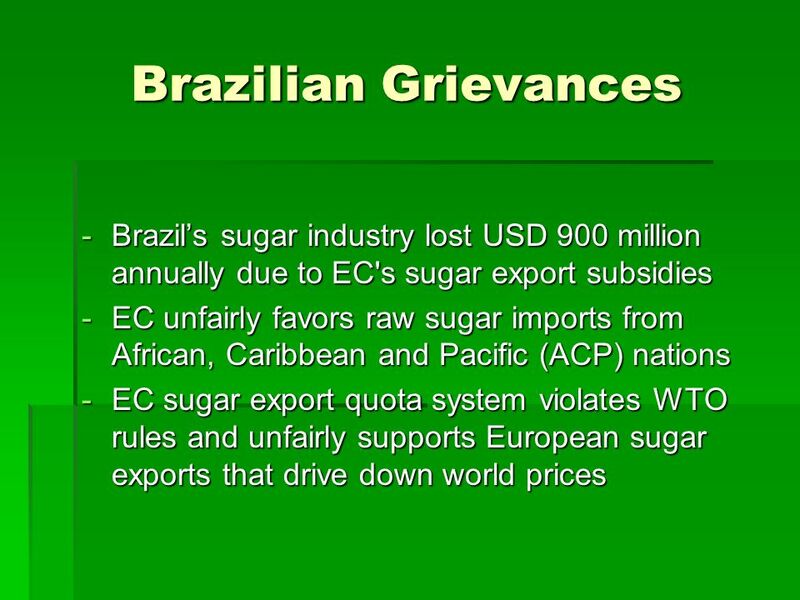 These articles applied to the lower priced sugar outside the of the ECs export quotas, which was a violation of the agreement. 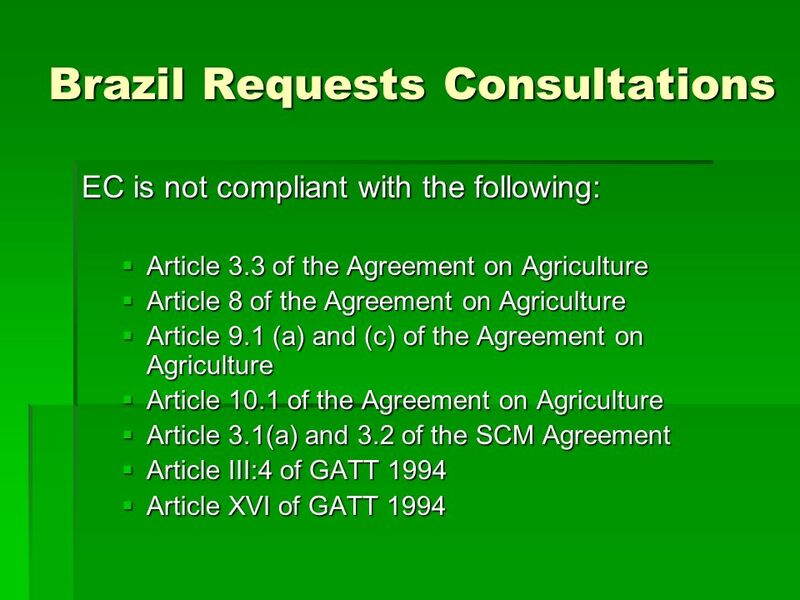 18 Panel Findings EC had acted inconsistently with its obligations under Articles 3.3 and 8 of the Agreement on Agriculture, by providing export subsidies within the meaning of Article 9.1(a) and (c) of the Agreement on Agriculture in excess of the quantity and budgetary outlay commitment level specified in Section II, Part IV of Schedule CXL. 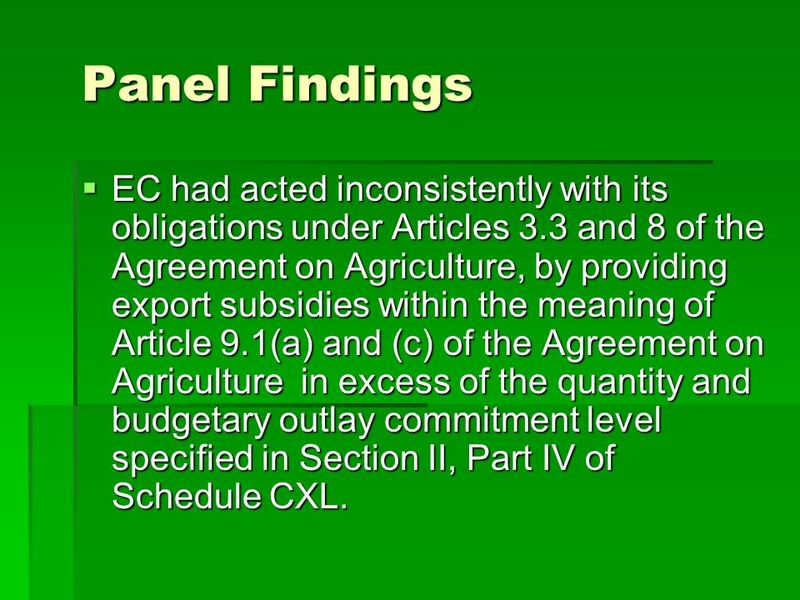 EC had acted inconsistently with its obligations under Articles 3.3 and 8 of the Agreement on Agriculture, by providing export subsidies within the meaning of Article 9.1(a) and (c) of the Agreement on Agriculture in excess of the quantity and budgetary outlay commitment level specified in Section II, Part IV of Schedule CXL. 19 Panel Findings The EC contravened its WTO commitments by subsidizing the re-export of ACP/India quota sugar both by not showing it in its reduction commitments and by exceeding the permitted level of subsidized exports. The EC contravened its WTO commitments by subsidizing the re-export of ACP/India quota sugar both by not showing it in its reduction commitments and by exceeding the permitted level of subsidized exports. 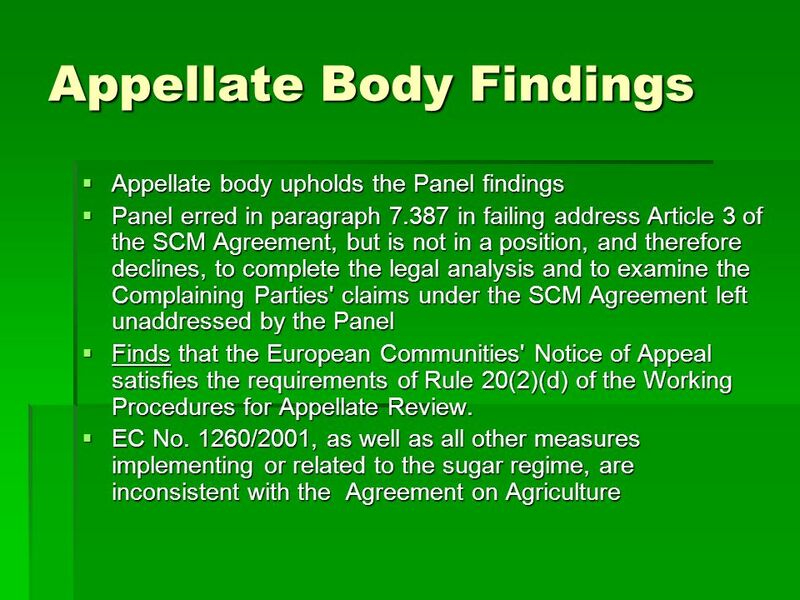 The ruling does not affect the right of the EC to import sugar from ACP/India on preferential terms. 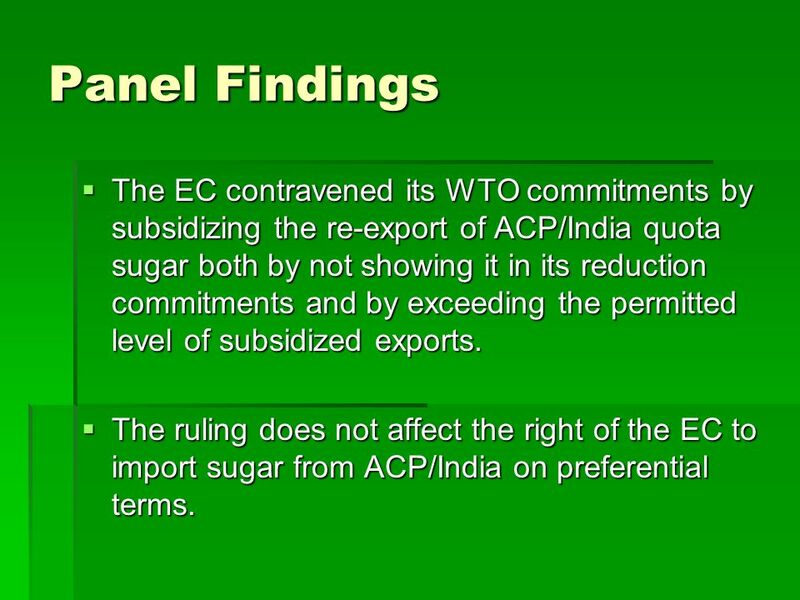 The ruling does not affect the right of the EC to import sugar from ACP/India on preferential terms. 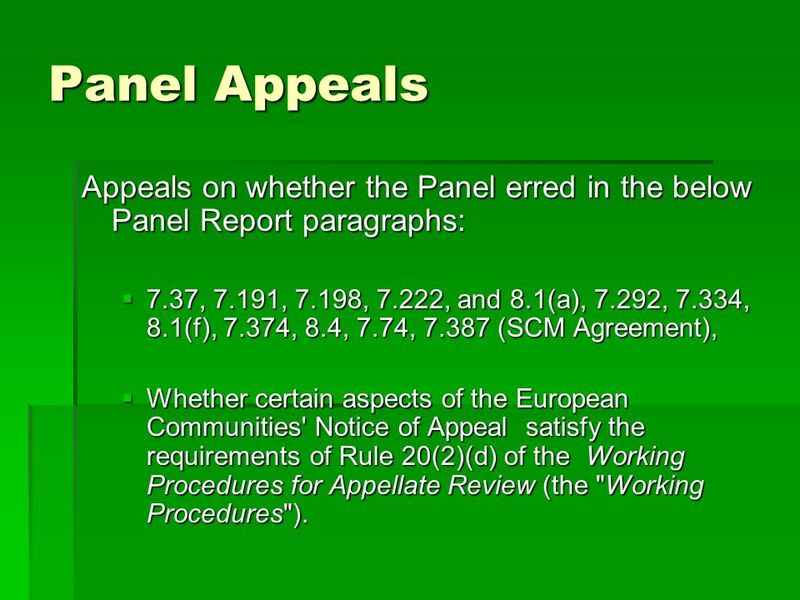 20 Panel Appeals Appeals on whether the Panel erred in the below Panel Report paragraphs: 7.37, 7.191, 7.198, 7.222, and 8.1(a), 7.292, 7.334, 8.1(f), 7.374, 8.4, 7.74, 7.387 (SCM Agreement), 7.37, 7.191, 7.198, 7.222, and 8.1(a), 7.292, 7.334, 8.1(f), 7.374, 8.4, 7.74, 7.387 (SCM Agreement), Whether certain aspects of the European Communities' Notice of Appeal satisfy the requirements of Rule 20(2)(d) of the Working Procedures for Appellate Review (the "Working Procedures"). Whether certain aspects of the European Communities' Notice of Appeal satisfy the requirements of Rule 20(2)(d) of the Working Procedures for Appellate Review (the "Working Procedures"). 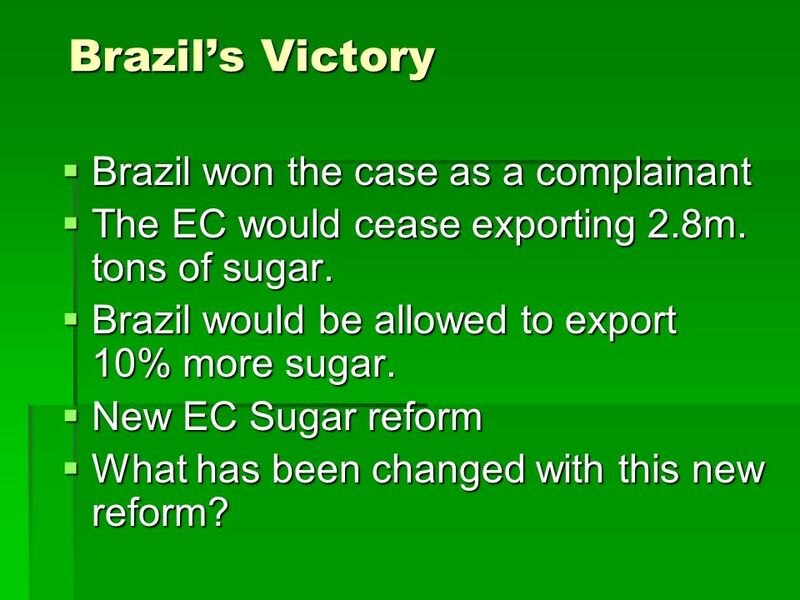 22 Brazils Victory Brazil won the case as a complainant Brazil won the case as a complainant The EC would cease exporting 2.8m. tons of sugar. The EC would cease exporting 2.8m. tons of sugar. 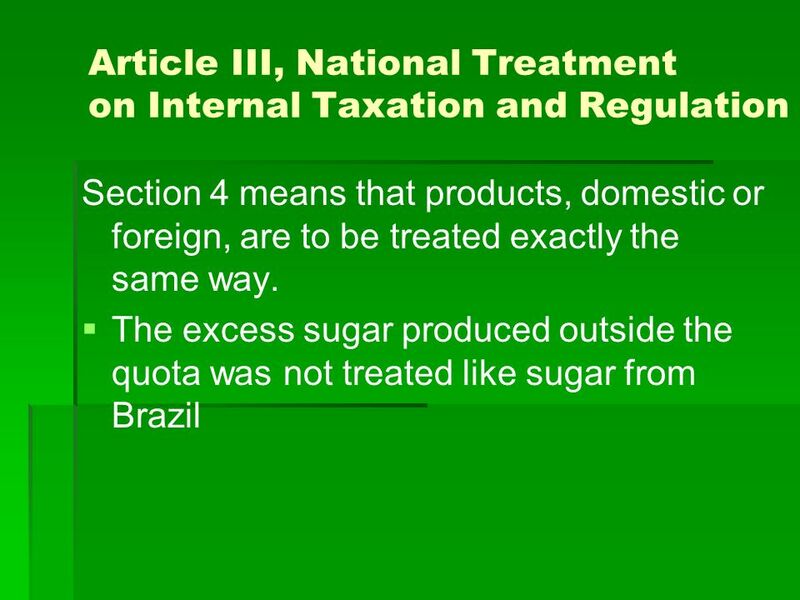 Brazil would be allowed to export 10% more sugar. 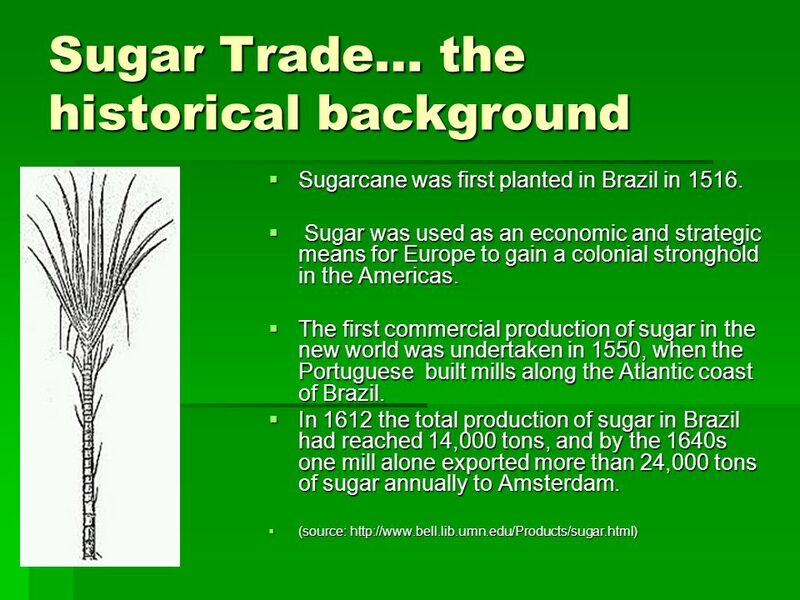 Brazil would be allowed to export 10% more sugar. 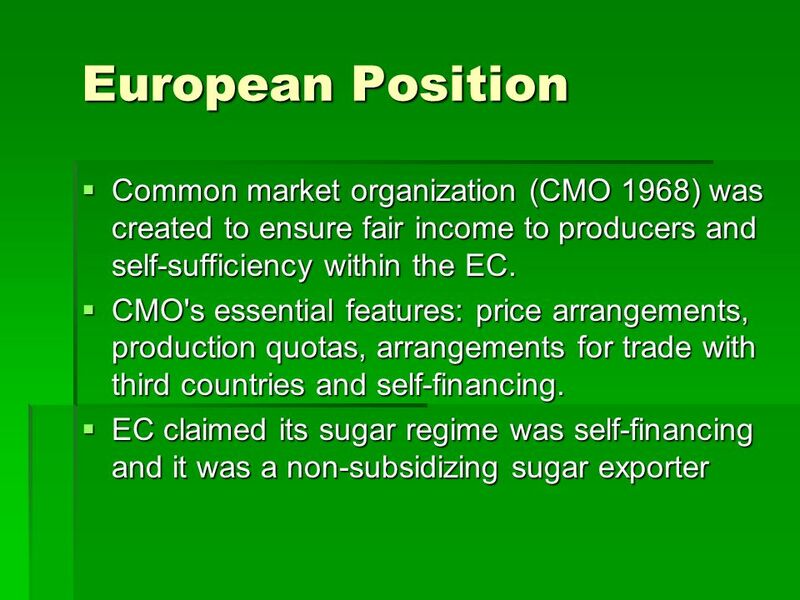 New EC Sugar reform New EC Sugar reform What has been changed with this new reform? What has been changed with this new reform? 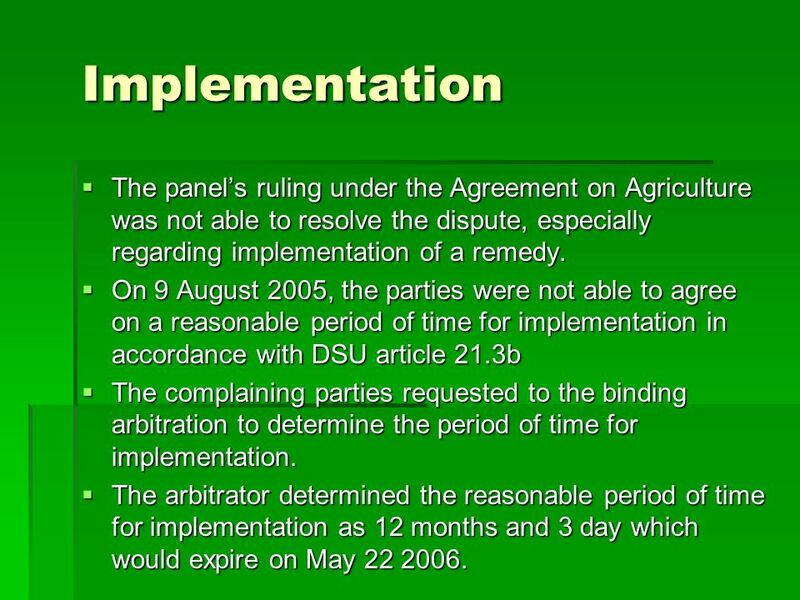 23 Implementation The panels ruling under the Agreement on Agriculture was not able to resolve the dispute, especially regarding implementation of a remedy. The panels ruling under the Agreement on Agriculture was not able to resolve the dispute, especially regarding implementation of a remedy. On 9 August 2005, the parties were not able to agree on a reasonable period of time for implementation in accordance with DSU article 21.3b On 9 August 2005, the parties were not able to agree on a reasonable period of time for implementation in accordance with DSU article 21.3b The complaining parties requested to the binding arbitration to determine the period of time for implementation. The complaining parties requested to the binding arbitration to determine the period of time for implementation. The arbitrator determined the reasonable period of time for implementation as 12 months and 3 day which would expire on May 22 2006. 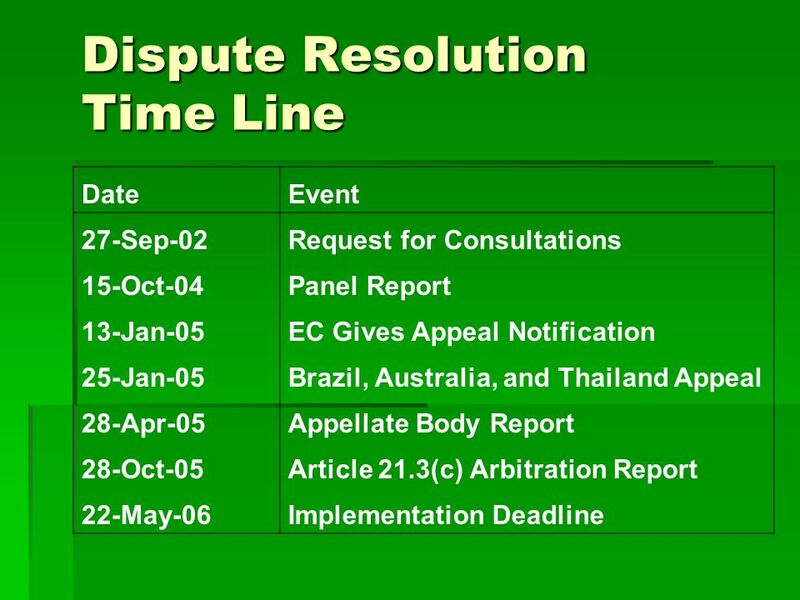 The arbitrator determined the reasonable period of time for implementation as 12 months and 3 day which would expire on May 22 2006. 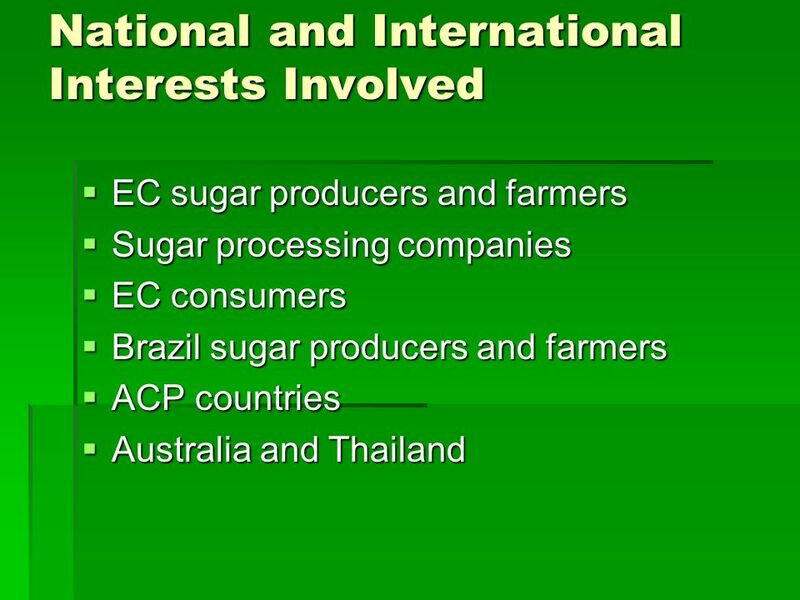 24 Proposals The EC has considered measures to bring its production of sugar more into line with domestic consumption fully respecting its international commitments with respect to imports, including its commitments to developing countries. The EC has considered measures to bring its production of sugar more into line with domestic consumption fully respecting its international commitments with respect to imports, including its commitments to developing countries. Reform its sugar regime fully standing by its commitments to ACP countries and India. 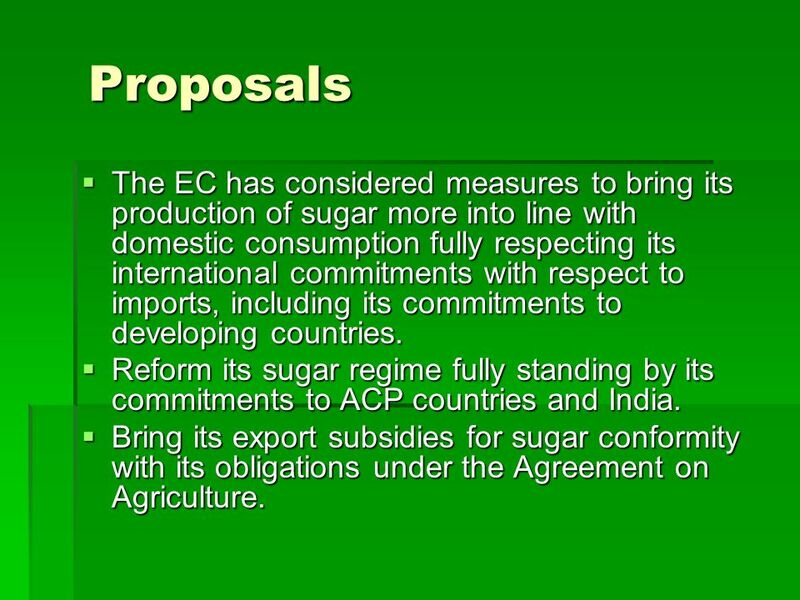 Reform its sugar regime fully standing by its commitments to ACP countries and India. 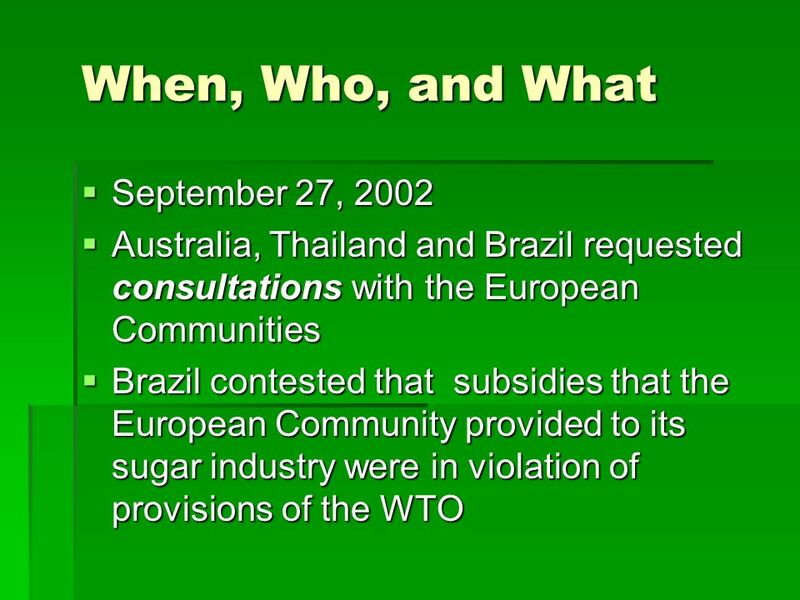 Bring its export subsidies for sugar conformity with its obligations under the Agreement on Agriculture. 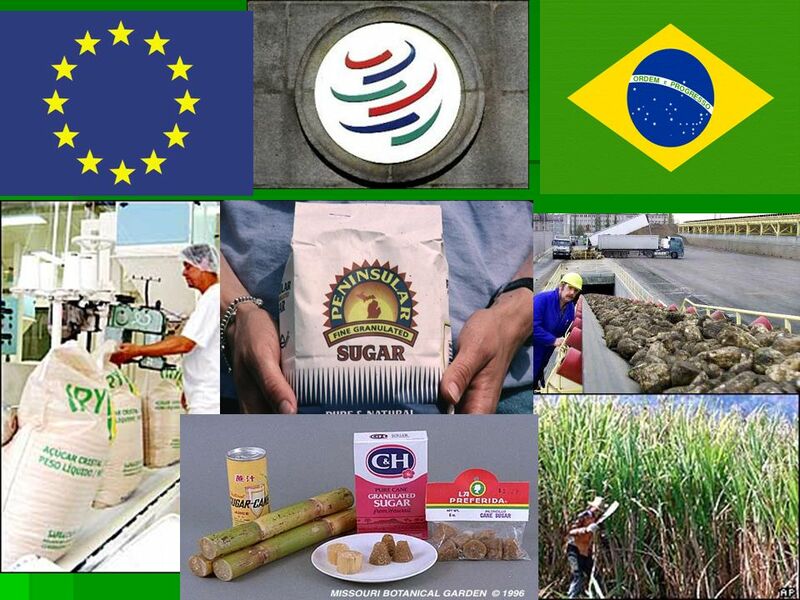 Bring its export subsidies for sugar conformity with its obligations under the Agreement on Agriculture. 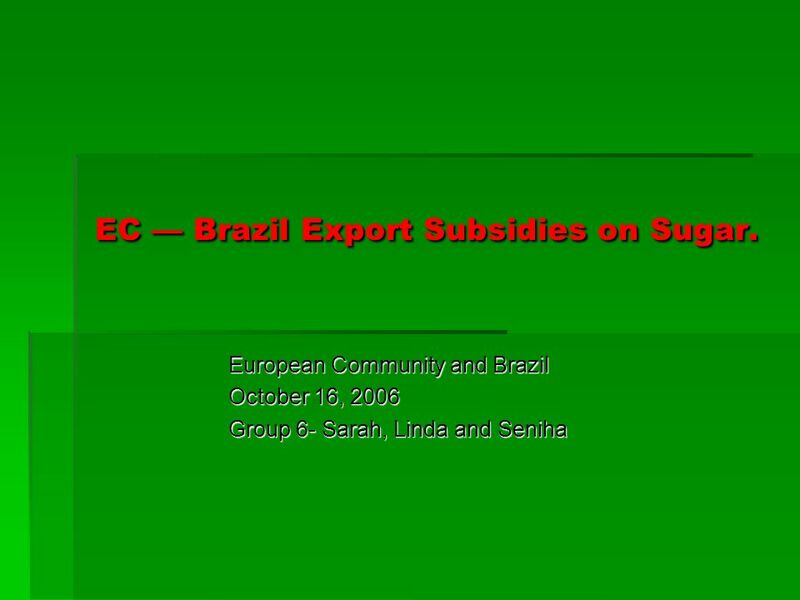 Download ppt "EC Brazil Export Subsidies on Sugar. European Community and Brazil October 16, 2006 Group 6- Sarah, Linda and Seniha." Bananas: EU vs US. By Izabella Zakaryan Andrea Zizack. 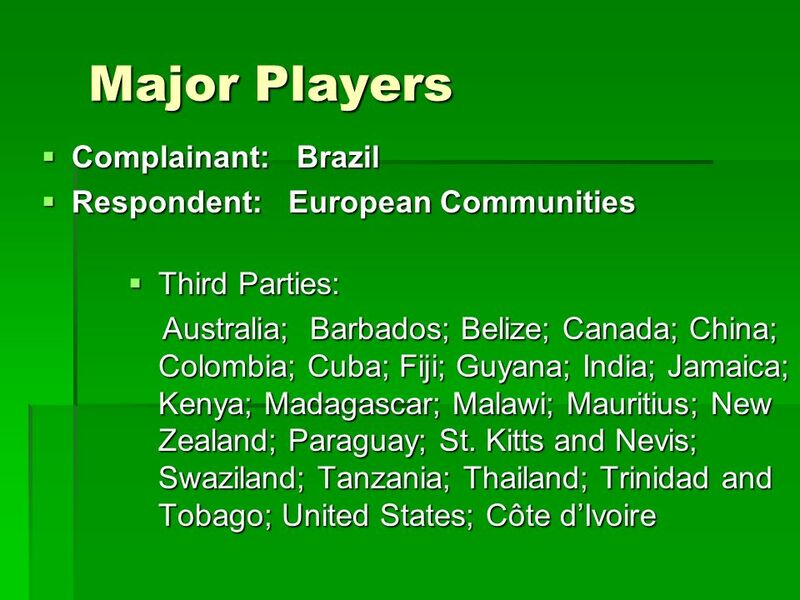 PRESENTED BY DANWE NDIKWE &RYAN MYERS CASE: EUROPEAN COMMUNITIES (EC) vs. BRAZIL: Export Subsidies on SUGAR. Advisory Centre on WTO Law Centre Consultatif sur la Législation de lOMC Centro de Asesoría Legal en Asuntos de la OMC Daring to Dispute: Africa and the. Meeting with AMCHAM in Poland Warsaw, April 5th 2005 Mieczysław NOGAJ Director of the Department of Trade Policy Ministry of Economy and Labour Department. Bush Steel Tariffs Case Presented By: Kultara Vongsumedh Rob Miller Michelle Vine Brendan Gibbons. Chapter 6 Tariffs. Copyright © 2007 Pearson Addison-Wesley. All rights reserved. 6-2 Topics to be Covered Types of Commercial Policies Tariffs and Types. First edition Global Economic Issues and Policies PowerPoint Presentation by Charlie Cook Copyright © 2004 South-Western/Thomson Learning. All rights reserved. Copyright © 2012 Pearson Addison-Wesley. All rights reserved. Chapter 9 The Instruments of Trade Policy. Multinational corporations Structure –Parent company + domestic operations –Foreign affiliate(s) Foreign direct investment (FDI) –Building or buying a.